When I used to go on family trips as a kid, I never took photos with actual people in them. My formal purism was absolute: in the frame there were to be no people, cats, birds, livestock, nor any creeping thing. As a result, rather than heartwarming pictures of my family and those closest to me from my childhood I have boxes full of fairly nondescript photos of buildings. Skyscrapers, historic churches, the Parliament buildings in Ottawa – formidable structures portrayed without a trace of the creatures who build and inhabit them. 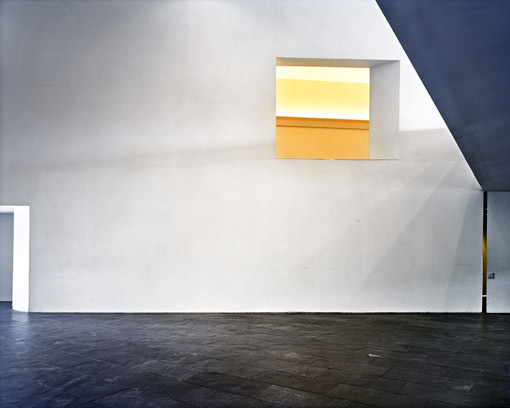 This may explain my attraction to the photography of Lynne Cohen, whose work explores urban landscapes devoid of human presence. 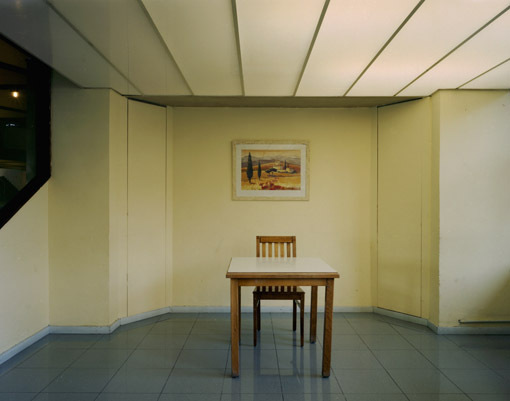 In their austerity and strange beauty they invite comparison with Hopper (such as his “Sun in an Empty Room,” which I mentioned previously here) and raise interesting questions about space, presence and architectural form. I remember reading a short story by Ray Bradbury called “There Will Come Soft Rains” which narrates the story of a normal suburban house after its human inhabitants are long gone (raptured? killed off in some cataclysmic event?). 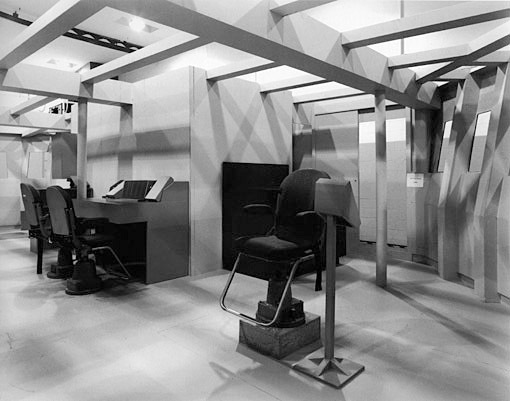 What kind of structures and forms have we imposed on our environment? What is the nature of the beauty we find in the urban environment, in still, quiet corners of office buildings and suburbs? Will these monuments outlive us? Seeing constructed edifices without humans to populate them reconfigures our experience of the (post)modern city. Turning to the agrarian side of things, I stumbled across these wonderful photos of churches in Northern Uganda. The buildings, centred in the frame, serve as anchors – fixed points of reference in a shifting landscape (geographically, politically, socially). People come and go, but these buildings – of course tainted by colonialism, but still symbols of hope and stability – remain. 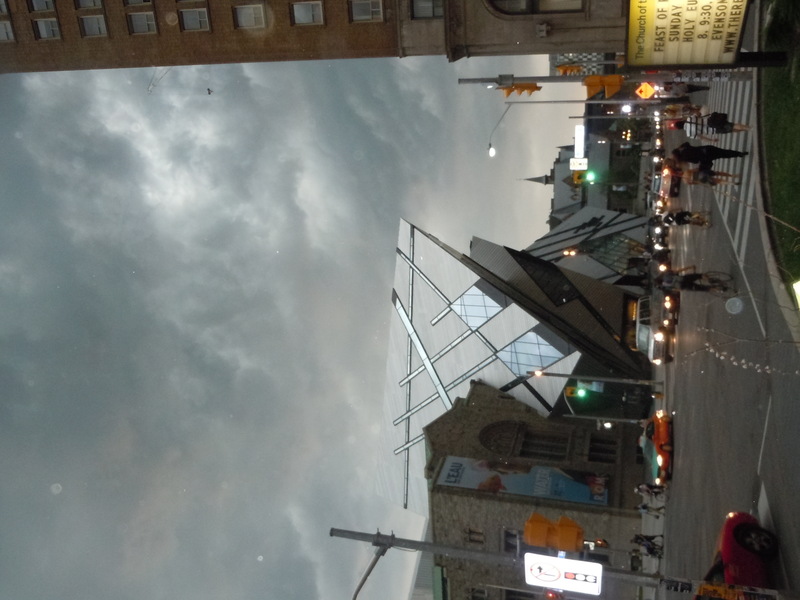 I can’t remember if it was Andrea or I who took this last image, but it is definitely in the tradition of my childhood vacation photos – it shows the Lee-Chin Crystal at the ROM just as a lightning storm was whipping the sky into an apocalyptic frenzy. At that exact moment we were both struck by the smallness of the human figures beside both the manmade monolith and the vast, sublime forces of the sky. Thanks for the pingback! I should point out though that the churches featured on my blog are about 80% post-colonial. Religious colonialism perhaps? Is there such a thing? An important correction (seems obvious now! ), thanks for noticing – you are in a much better position than I am to talk authoritatively about the religious history of Uganda! I guess there might be a sort of “architectural colonialism” as some of the buildings do look quasi-“European” despite their postcolonial origin… but in terms of space and place, these are very much African churches in African environments, and all the more striking for it.